Ireland reports late hence we have data for the EMU 18, not the 19, in the table below. If we rank each countries' sentiment index back to 1987 or to the start of its series on sentiment, we find only two, Slovakia and Greece lie below their historic midpoints (below 50%). Only Estonia and Belgium have rankings in their 70th percentiles. Six other countries have rankings in their 80th percentile deciles and the remaining eight countries have rankings in their top 10 percentile, in the 90th decile. All sentiment readings except for Slovakia are above their respective period averages. These are exceptionally strong readings going back for some as long as 30 years. The sector indexes echo the strength with upper 90th percentile standings across industry, construction, retailing and for consumer confidence. However, the services sector, a very large and important sector of the economy, bears a ranking in its 74th percentile, a much more moderate reading. As far as momentum is concerned, January is a break with the upswing. 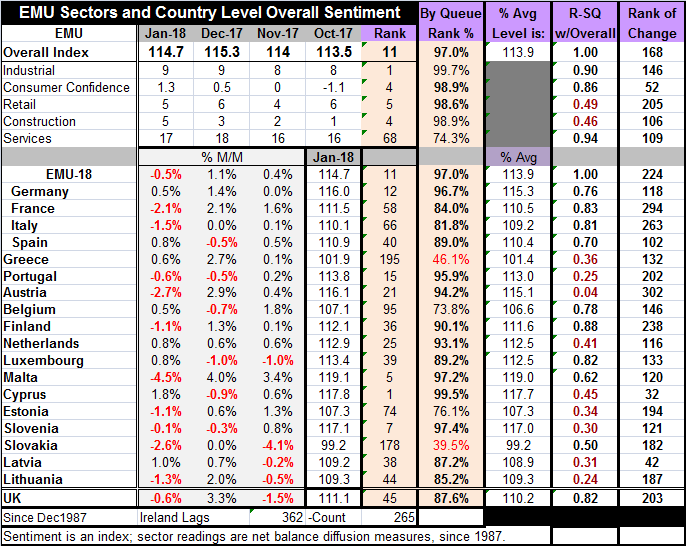 Ten of 18 reporters show reduced sentiment levels in January. Six of 18 show setbacks in December while only four of the smaller economics showed declines in sentiment in November. In January, there are exceptionally strong readings for Cyprus, Malta, Slovenia and Germany. Portugal has a global ranking that has been higher only 15 times. Austria has been stronger only 21 times. Still, the country-level rankings are quite mixed with lows ranging from a ranking in Greece of 195, 178 in Slovakia and 95 in Belgium, to a top, number one ranking, in Cyprus. Yet, there is enough strength in enough large economics to boost the euro area reading itself which has been launched to its 11th highest standing. Still, the graphic makes it clear that the EMU is losing momentum. The index readings for the largest economies have stopped rising. The lesson of history is that once these indexes lose their upward momentum, it does not quickly kick back in. Peaking is not a transition to plateauing. It is an antecedent of slowing.